Join the discussion on our forums! Come discuss Dragon's Fury over in our dedicated Dragon's Fury discussion topic. with Deck of Wonders you're almost guaranteed to get a 5 Mana Dragonfire Potion. I didn't even think about that! Putting 5 additional 5-cost spells in your deck is insane synergy with this card. ...wow that is actually very sweet deal! Maybe in a Hemet burn deck. Otherwise it seems way too inconsistent. Pushing Big Spell Mage right before rotating out Medivh, the Guardian. It'll be a fun few months. It's a little awkward that you almost certainly still need/want secrets and probably Arcane Intellect-- but 5 mana Hellfire that doesn't hurt you still seems fine. Interesting card. Pretty good effect. Not metadefining, but definitely will see play. 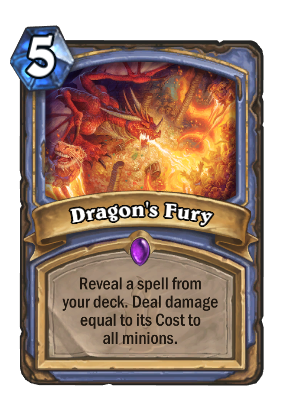 Not sure I like where mage is going with all those "high cost spells" sinergies..